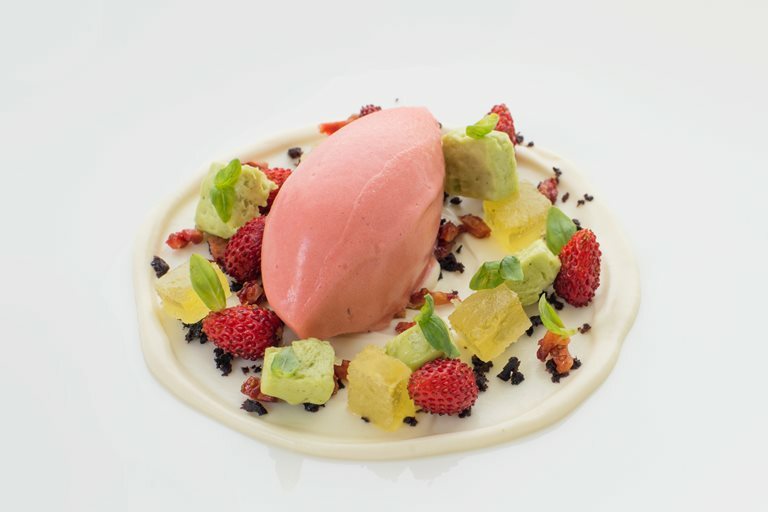 This strawberry dessert from chef Adam Simmonds contains hints of the savoury, with dehydrated petit niçoise olives adding a pleasant kick. This, combined with a eucalyptus mousse, strawberry sorbet and olive oil pâte de fruit results in a complex, multi-layered dessert that offers a refreshing antidote to an indulgent meal. For the pistachio parfait, start by lining a mould measuring 19x10x0.8cm. Combine the pistachio paste and milk until fully emulsified then fold in the remaining 50g of pâte à bombe and 60g of cream.